Chicago, IL – On May 18, Filipino youth and student leaders from across the US convened at the Centro Autonomo community center, located in the Albany Park neighborhood of Chicago, for the historic Anakbayan-USA Founding Congress. The congress established Anakbayan-USA as a nationwide organization and overseas national chapter of Anakbayan Philippines in the midst of city-wide protest marches and rallies against the ongoing North Atlantic Treaty Organization (NATO) Summit. This, according to organizers, is their symbolic protest and act of defiance against the global 1% represented by NATO. The theme of the founding congress declared the purpose and direction of Anakbayan-USA: “Makibaka! Huwag Matakot! Unite and Strengthen the Filipino Youth Movement in the US to Advance the Struggle for National Democracy in the Philippines!” The theme is aimed at calling on the youth to join the struggle against the increased repression in the US and to contribute to the struggle for genuine social change in the Philippines. “It [AB-USA Founding Congress] couldn’t have come on any other day than today, in the face of G8 and NATO. This is our act of defiance. Our coming here together as youth and students of our people is our act of defiance in the face of imperialism. We owe this to our brothers and sisters who have suffered and who have sacrificed their lives to fight for our people’s liberation,” said Yves Nibungco, elected founding National Chairperson of Anakbayan-USA. Over 60 delegates from Anakbayan chapters in Seattle, Los Angeles, New York, New Jersey, San Diego, East Bay (Oakland), Silicon Valley and Chicago, including delegates from affiliate organization, League of Filipino Students (LFS) – San Francisco State University came to the founding congress to approve a General Program of Action and elect the National Executive Committee of Anakbayan-USA. Those elected were Yves Nibungco of Anakbayan New Jersey as Chairperson, Janelle Quibuyen of Anakbayan Seattle as Vice Chairperson, Eric Tandoc of Anakbayan Los Angeles as Secretary General, Ivan Penetrante of Anakbayan San Diego as Education Officer, Noemi Teppang of Anakbayan Silicon Valley as Finance Officer and Lyle Prijoles of the League of Filipino Students-SFSU as Solidarity Officer. The keynote speech was delivered through a pre-recorded video by Jose Maria Sison, the exiled Filipino revolutionary and founding chairperson of the seminal Filipino youth organization, Kabataang Makabayan (KM). “We are certain that your congress will strengthen your resolve and will instruct you to arouse the Filipino youth throughout the US, expand and consolidate Anakbayan-USA and mobilize an increasing number of Filipino youth along the line of anti-imperialist and democratic struggle and militant support for the struggle of the Filipino youth and people for national liberation and democracy in the Philippines,” said Sison. A live message was given via Skype by Renato Reyes, Secretary General of Bayan Philippines and founding chairperson of Anakbayan Philippines in 1998, in which he affirmed the role of Anakbayan in the US. “Anakbayan can introduce Philippine history, society and revolution to a growing number of Filipino-Americans who long to understand their roots and the struggle in the homeland. At the same time, the Fil-Am youth experience first-hand problems of racism and discrimination as well as economic exploitation and imperialist war. Anakbayan should also organize the immigrant youth who are familiar with the severity of the crisis in the Philippines, often the reason why they have to migrate,” said Reyes. Chanting “Makibaka! Huwag matakot!”, a protest chant popularized during the anti-Marcos dictatorship struggle in the 70’s, members of Anakbayan-USA pledged “to continue to expose the rotten character of the Aquino regime and to raise the struggle for national democracy to a new level of intensity.” The delegates concluded the founding congress with a group oath-taking and singing of progressive Filipino songs. 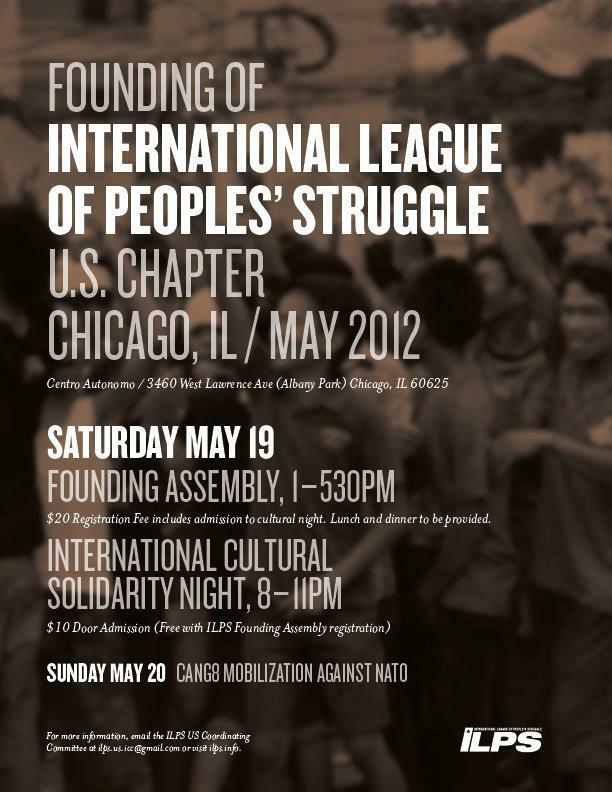 CHICAGO– Filipino-Americans from across the US will gather in Chicago on Sunday, May 20, 2012 to join the nationally-coordinated protest demonstration against the scheduled NATO Summit in downtown Chicago. The protest is scheduled two days after the fourth congress of the US Chapter of Bagong Alyansang Makabayan, also known as BAYAN USA, which will also take Chicago on Friday, May 18th, at Centro Autonomo in Chicago’s Albany Park neighborhood. Founded in 2005 in San Francisco, BAYAN USA is an alliance of 15 Filipino community organizations across the US who have actively campaigned on issues of human rights, immigrant reform, workers’ rights, racial and gender discrimination, environmental justice, budget cuts as well as US economic and military intervention and counter-insurgency in the Philippines for the past 7 years. The congress and protest comes at the heels of high-level talks in Washington between representatives from the administration of Philippine president Benigno Aquino III and US Secretary of State Hilary Clinton and US Defense Secretary Leon Panetta last month, confirming the so-called “new” US military pivot to the Asia-Pacific region to contain the so-called “rising threat” of China will rely heavily on an increase of US military troops in the Philippines, where at least 600 US special forces operatives have been deployed in Mindanao under the auspices of post-9/11 counter-terrorism exercises. In light of the upcoming G8 and NATO Summit meetings in the US this month, BAYAN USA will raise the issue of the US-led neoliberalism through the TPPA and military agenda through the US military pivot to the Asia-Pacific region, to the protest demonstration in Chicago. MAKIBAKA! HUWAG MATAKOT! Unite and Strengthen the Filipino Youth Movement in the U.S. to Advance the Struggle for National Democracy in the Philippines! Unite and Strengthen the Filipino Youth Movement in the U.S.
To Advance the Struggle for National Democracy in the Philippines! Today, as the people and working class all over the world militantly march for International Workers’ Day, we announce the upcoming Founding Congress of Anakbayan-USA on May 18, 2012 in Chicago. As the first overseas national chapter of Anakbayan, we will continue to build the first nationwide Filipino youth movement that clearly recognizes the integral role of US-born and migrant Filipino youth in the struggle for national liberation and genuine democracy in the Philippines. Anakbayan was founded on November 30, 1998, one hundred and thirty-five years after the birth of Andres Bonifacio, the working class revolutionary leader who founded the Katipunan and fought for national liberation against Spain. It was formed to take up the historic task of arousing, organizing and mobilizing a powerful key force in Philippine society, the Filipino youth. In 2001, only three years after its establishment, Anakbayan emerged as one of the leading forces in mobilizing hundreds of thousands of youth in the massive people’s uprising now known as “People Power II,” which ousted President Joseph Estrada. Since then, Anakbayan has consistently been at the forefront of the Filipino youth movement in advancing the struggles of oppressed and exploited communities nationwide for genuine independence and democracy in the Philippines. As soon as Anakbayan was founded in the Philippines, migrant and US-born Filipino youth heeded its call to continue the Katipunan’s unfinished revolution of 1896. Progressive Filipino youth and student organizations across the US immediately affiliated with Anakbayan and in 2002, finally established the first overseas chapter in Seattle. Since then, Anakbayan has spread across the country to major cities with large concentrations of Filipino youth, including Los Angeles, East Bay, New York, New Jersey, San Diego and Silicon Valley. Anakbayan chapters in the US have been at the forefront of protecting the rights and welfare of our kababayans by linking and raising social justice issues here in the US to the struggles of the oppressed and exploited back home in the Philippines. Anakbayan has fought against education budget cuts, struggled to defend immigrant rights, linked arms with workers to recover stolen wages and sought justice for trafficked workers. We are now confronted with a protracted global economic crisis and rising fascism. According to the US Department of Labor, 1 in every 2 youth is jobless while thousands continue to lose their jobs from mass layoffs. Meanwhile, higher public education remains inaccessible to most students as tuition fees continue to increase at an annual average rate of 8% nationwide, with some public universities raising tuition by as much as 31%. As private detention centers rake in profits, the Obama administration continues to systematically carry out record-breaking deportations, which have displaced 1.2 million immigrants since he was elected into office. Undocumented youth continue to live in a nightmare as the DREAM Act mutates into a selective military draft for immigrant youth to be used as frontliners in countless wars of imperialist aggression in our home countries. In anticipation of a surge in people’s resistance, we see the rise of a fascist police state in the US through the enactment of the National Defense Authorization Act of 2012 (NDAA) and other repressive laws like Cyber Intelligence Sharing and Protection Act (CISPA) and HR 347 “Anti-Protest Law”. While the civil and political rights of all Americans are being attacked, the US continues to impose its violence against people across the world in pursuit of increasing profits. 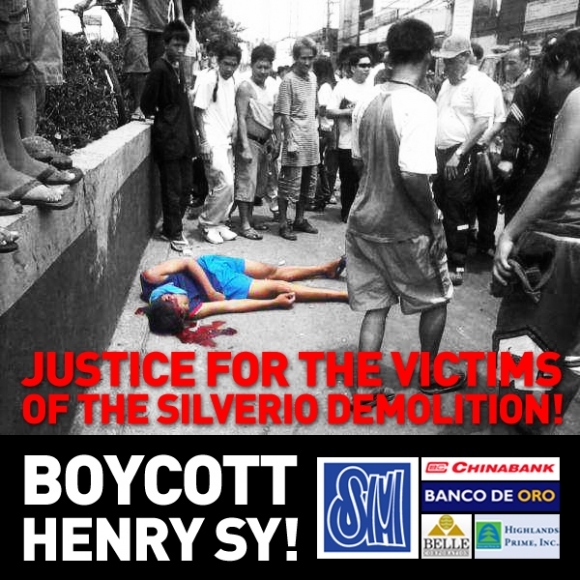 In the Philippines, the struggle continues to intensify as the crisis of the semi-feudal and semi-colonial society worsens and US military intervention increases to protect the economic interests of multinational corporations. True to his class, the landlord President Noynoy Aquino continues to faithfully serve imperialist, big business and big landlord interests by ensuring the increased exploitation of workers and even allowing US drones to drop bombs on our people. Clearly, the Filipino youth have no bright future within the current system. There is no other way for the youth but to fight back. Through Anakbayan-USA, Filipino youth across the US are unifying and strengthening their community organizing efforts in order to carry forward the historic torch of courageous and daring youth that paved the way before us. From the legacy of the anti-colonial resistance of the Katipunan and the Kabataang Makabayan that defied the iron fist of the Marcos dictatorship, we will continue to advance the struggle for national democracy in the Philippines until its eventual victory. We play a crucial role here in organizing Filipino youth of all backgrounds and building international solidarity with all oppressed communities and countries. We call on the Filipino youth to defiantly declare “Makibaka! Huwag Matakot!” Join the struggle and don’t be afraid! Let this call resound throughout the campus halls, workplaces, and in the streets. Let us unite and build this movement. Let us fulfill our revolutionary role as Filipino youth and serve the people!